Eight decaying war memorials are likely to be repaired after being awarded grants totalling £87,000. Monuments in Orkney, Stirlingshire and Falkirk will be among those which will benefit from the fund. 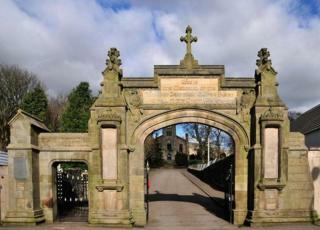 Kirkintilloch war memorial has received the largest grant - more than £48,000 for major repairs to Peel Park archway. The Centenary Memorials Restoration Fund also awarded almost £27,000 to Lennoxtown's Campsie memorial to repair its stonework arch and ironwork gates. It coincides with commemorations for the centenary of the beginning of the Battle of Verdun - one of the longest and bloodiest battles of World War One. The fund is funded by the Scottish government and Historic Environment Scotland, and it is administered by the War Memorials Trust. Since it was launched in 2013, grants totalling £617,000 have been offered to 73 Scottish war memorials. The trust's director, Frances Moreton, said: "It is wonderful that since the fund launched in 2013, communities across Scotland have received funding to support the repair and conservation of their local war memorials. "Over 70 memorials have benefitted so far but hundreds of memorials across Scotland remain in poor or very bad condition. "With funding still available we hope that many more repair and conservation projects will emerge."